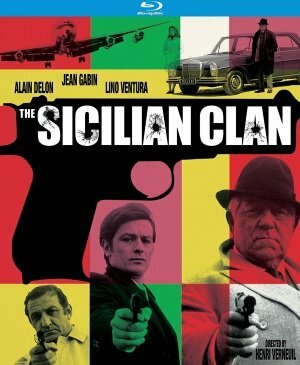 Three of the great icons of French crime cinema team up for The Sicilian Clan (France, 1969) (Kino, Blu-ray, DVD). 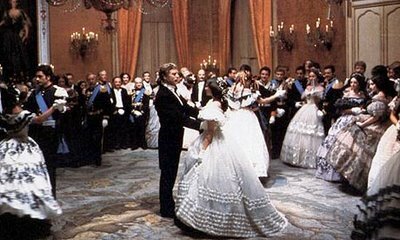 Jean Gabin is Vittorio Manalese, the head of the Sicilian Manalese clan in Paris, Alain Delon the reckless, amoral French criminal and killer Roger, who hires Vittorio’s clan to spring him from custody, and Lino Ventura Commissaire Le Goff, the man who captured Roger. 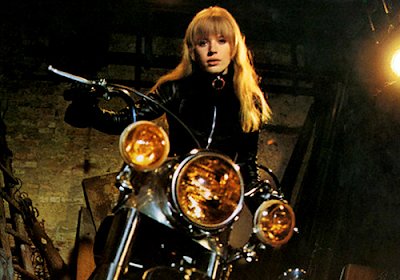 After Roger escapes, Le Goff struggles with is efforts to give up smoking. The film opens with a terrific escape, not from prison but from prison transport in the chaos of a traffic snarl, in a nicely-engineered sequence crisply directed by Henri Verneuil. No guns needed here—the Manalese clan doesn’t kill during their capers—and Vittorio is wary of Roger, a loner who has killed more than one cop in his robberies, as he puts him up in a private apartment above the family home. But when Roger brings a big jewel heist his way, he agrees to partner up and proceeds to find a New York partner and case the target: an exhibition hall in Rome with state-of-the-art security. Vittorio meets up with distant New York mob cousin Tony Nicosia (played with dapper charm by Amadeo Nazzari), who he hasn’t seen for thirty years, and they slip into instant rapport and easy friendship as if no time has passed as they case the Rome exhibit. When they find the new technology impenetrable, Vittorio comes up with a new plan: hijacking the flight delivering the jewels to New York City in a genuine family affair.